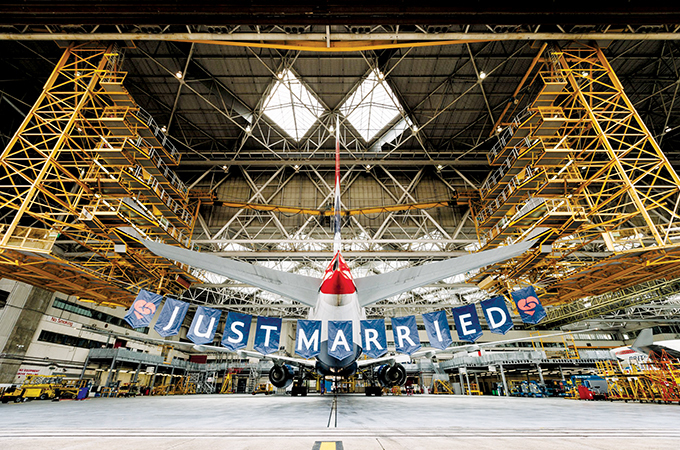 British Airways added an extra sparkle to customers’ journeys last month to celebrate Prince Harry’s marriage to Meghan Markle. The BA93 to Toronto – the city where their relationship took off – operated an all-star crew of only Meghan’s and Harry’s on May 19. The 10-strong cabin crew, made up of two Harry’s, seven Megan’s and one Meghan, operated the flight that departed Heathrow at 1.10pm, an hour after the couple said ‘I Do’ at Windsor Castle, just seven miles from the airport. Senior first officer, Harry Blake, was behind the controls of the flight deck, alongside the Captain. To celebrate the Royal couple, any customer departing from Terminal 5 on that big day, who was called Harry, Meghan or Megan with their travel companions, were invited to use the airline’s First lounge, accessed through the exclusive First Wing. The celebrations continued as individual lemon and elderflower Victoria sponges, the same flavour as Harry and Meghan’s wedding cake, were given out to customers departing from Heathrow on May 19. Additionally, on the Toronto celebration flight, the ‘Royal Crew’ gave every customer on board their individual celebratory wedding cake.